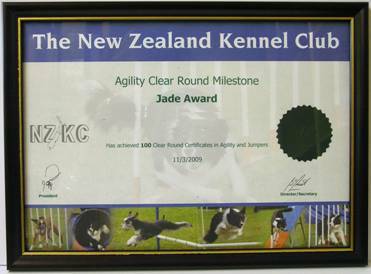 Milestone awards are available for agility dogs to achieve. The awards recognise those dogs who have gained clear rounds in Agility and Jumpers classes. To be eligible, a minimum of one certificate must be gained on or after 1 January 2009. The certificates are available from the NZKC. To apply for your clear round milestone award, use the application form on the forms page of this website. 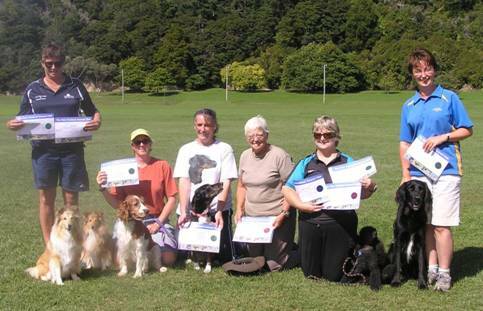 Milestone award recipients with their certificates at Upper Hutt Dog Training School in March 2009. Lou Baker, Penny Nalder, Colleen O'Connor, Noelene Wagener, Sharon Wagener, Elaine Herve.